Experiencing a sliver of sunlight in their otherwise miserable existence since the passing of their parents, the Baudelaire orphans peruse a cookbook in the library of their kindly neighbor Justice Strauss after being given the daunting task of catering a dinner for their wicked uncle Count Olaf and his comrades. 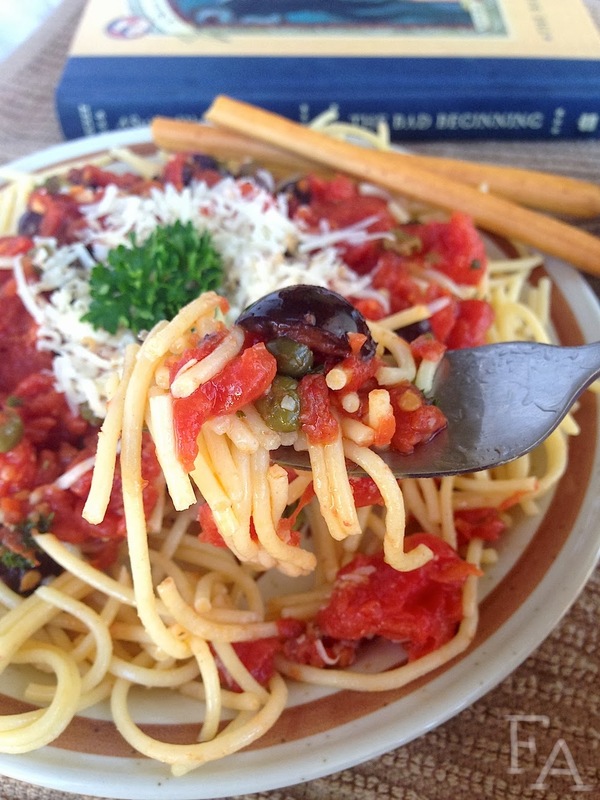 The children decide upon pasta puttanesca because it sounds entirely doable and then travel with the accommodating Strauss to market to purchase the needed ingredients with the very little money that was left them for the task. "'Puttanesca.' It's an Italian sauce for pasta. 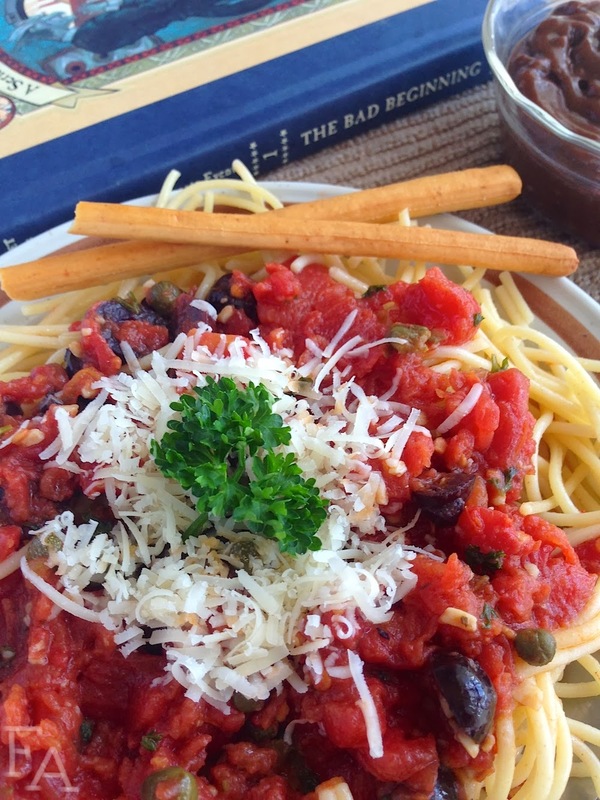 All we need to do is sauté olives, capers, anchovies, garlic, chopped parsley, and tomatoes together in a pot, and prepare spaghetti to go with it." 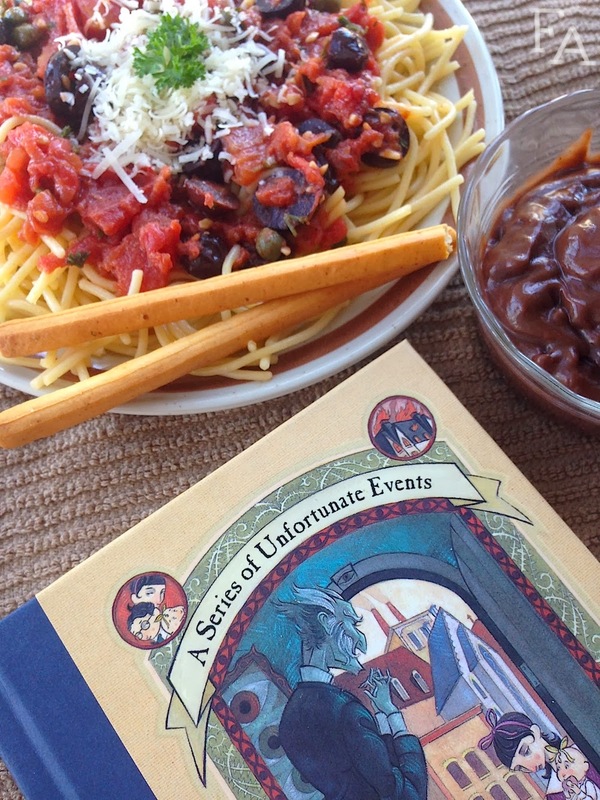 Found in The Bad Beginning, book the first (of thirteen) of Lemony Snicket's A Series of Unfortunate Events, pasta puttanesca is a quick and filling dish that Count Olaf was thoroughly dissatisfied with. Because he's horrible. But you won't be (dissatisfied that is. I surely hope you won't be horrible. 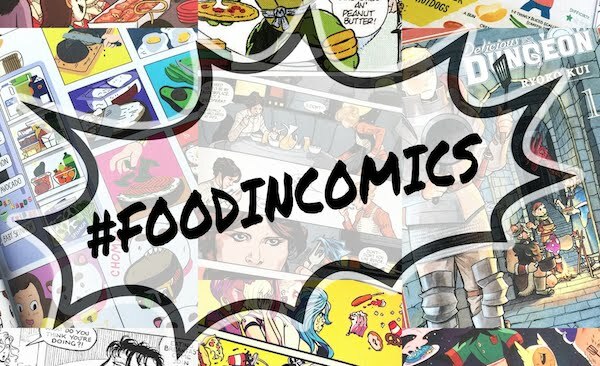 And FYI: you can't even taste the anchovies). 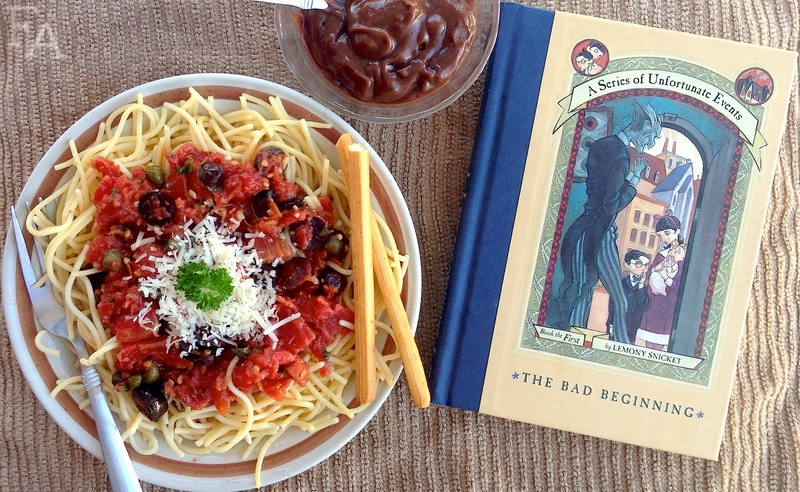 This pasta even made its way into the movie "A Series of Unfortunate Events" (2004, based on the first three books in the series). Note: In the book the children buy "interestingly shaped noodles" at a noodle shop while in the film they find a hodgepodge of loose pasta in a dirty kitchen drawer (which they then wash, cook, & strain through a window screen). I used spaghetti noodles, but you can totally mix it up with other types (I don't recommend random loose bits found in a drawer though). Also in the book the orphans "bought several envelopes of pudding mix" for dessert and it's later revealed to be chocolate pudding. 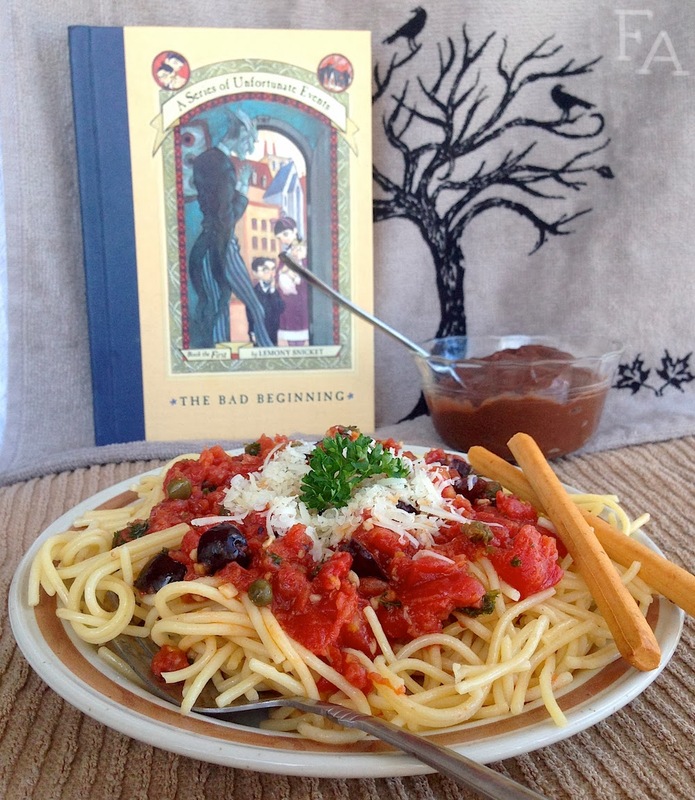 So after your feast of pasta puttanesca relax with a bowl of smooth chocolate pudding! And don't you dare get mad about not having roast beef. You didn't say you wanted it! 1 Can (28 oz.) Diced Tomatoes, drained, 2 Tbsp. liquid reserved. 1. 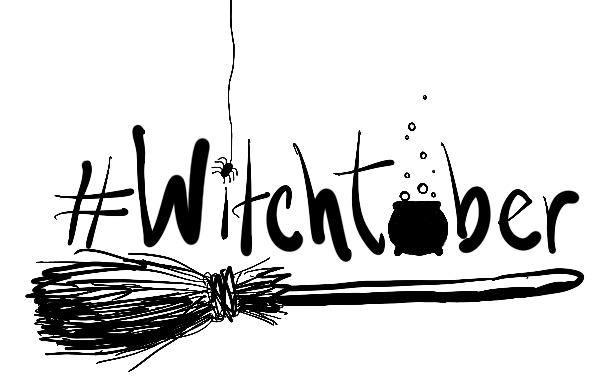 Fill a large pot about half full with water, sprinkle in a little salt, & bring to a rolling boil. Put in the spaghetti (or other) noodles & cook for about 8 to 10 minutes or until the noodles are cooked through. Drain the noodles & rinse under cold water. Toss with a little bit of olive oil & put in your serving dishes. 2. In a large pan over medium heat, sauté the minced garlic with the 2 Tbsp. olive oil until the garlic is golden. Add in the rest of the ingredients except for the fresh parsley & stir to combine. Simmer for about 5-6 minutes so everything is nicely heated through & the flavors are blended together. Turn off the heat & stir in the parsley & reserved 2 Tbsp. of tomato liquid. Spoon on top of noodles. Garnish with a fresh leaf of parsley, thin breadsticks, & a small amount of finely grated parmesan cheese (optional, but the parmesan especially tastes wonderful). Serve with red wine or purple grape juice & chocolate pudding for dessert.